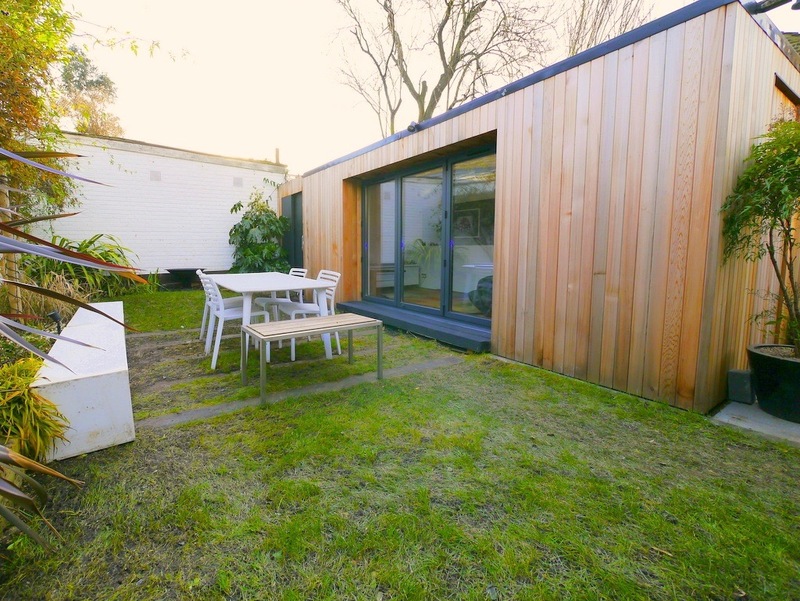 Our Tomoku Hus units combine exacting Swedish engineering and materials to create a durable, bespoke garden office studio. The perfect way to create extra living space, whatever your needs. At Garden2office we provide a complete service so you wont have to deal with the hassle of calling separate tradesman for each stage of the build. From ground work to interior flooring and electrical fitting, we organise and install all of it as part of the package. We also offer a wide range of additional extras so you can get exactly the building you want. Garden2office buildings are the only modular buildings on the UK market that fit triple glazing as standard. We don’t buy in budget Upvc frames, our units are built in our own factory, along with the wall blocks. That way we can control the quality, every time. We also offer a range of colour schemes for our Swedish windows and doors so you can match them with existing ones in your house or opt for a colour that matches the exact style you are aiming for. If you need a building that you can use all year around, night and day, it has to be well insulated. We use Isover glass wool insulation for our wall systems. This environmentally-friendly product gives us thermal ‘U’ values down to 0.18 (220mm wall units). We also fit block insulation in both the timber base and the ceiling so you are protected from the elements on all sides. The benefit is that you stay warm in winter and cool in summer, with exceptionally low heating costs. Sweden’s goal is to have an oil-free economy within 20 years, so it’s no surprise the building methods and materials have been carefully chosen for their sustainability. For example, our plywood isn’t just any plywood, it’s formaldehyde-free. The wall insulation can be up to 70% recycled material and factory assembly means less site waste. The combination of triple glazing and thick wall insulation is ideal for stopping sound. If you live near a busy road or railway, your building will reduce noise levels from 80 to 36dB. It works both ways, of course, teenagers with drum kits or a home cinema set-up won’t annoy your neighbours. 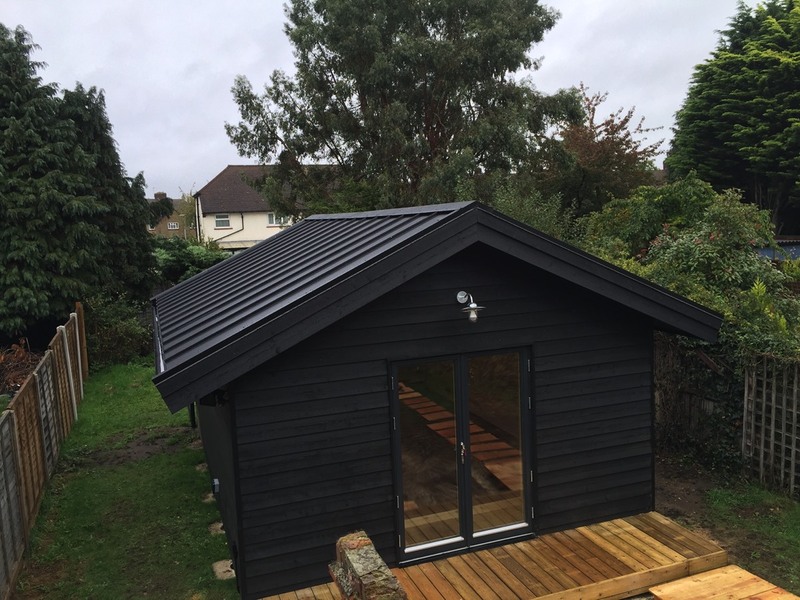 The sound insulating properties are so popular with our customers that we now regularly install garden studios designed solely as music rooms and recording studios! Our housebuilding expertise in Scandinavia means we can make exactly the building you want, give or take 300mm. The wall and window units can be assembled in millions of combinations and sizes. If you need a building up to12.5m wide, we can help. We’ll also help you design the building you want, rather than try to sell you a building from a range. 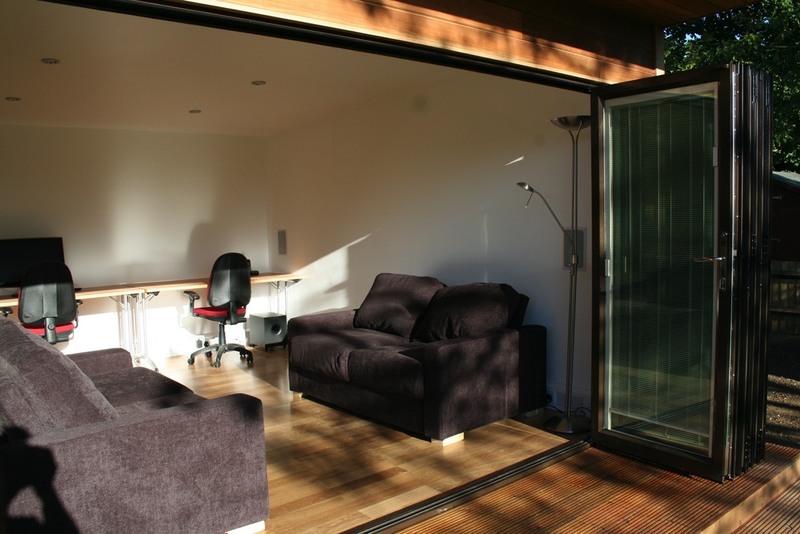 There’s never been a more cost effective way of adding extra space to your home or business. Loft conversions and brick extensions mean disturbance to your home and a higher cost. 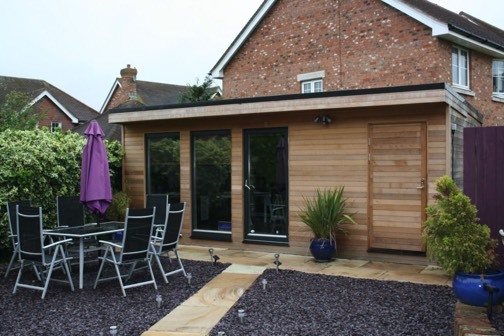 What’s more, a well-built garden room can make your property a lot more saleable in tough times and more valuable in the good times. 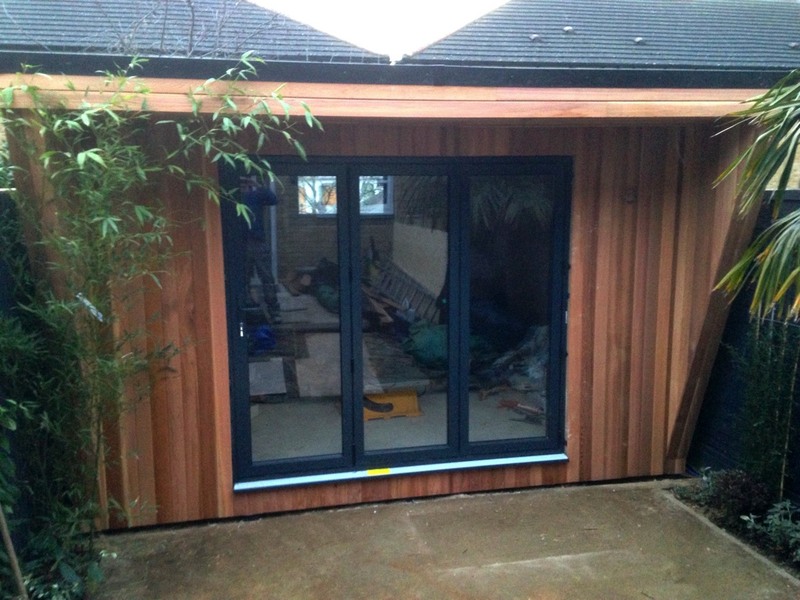 We work with you to design a building to suit your home and garden. We don’t just make one style. Our unique modular system is more flexible than most. 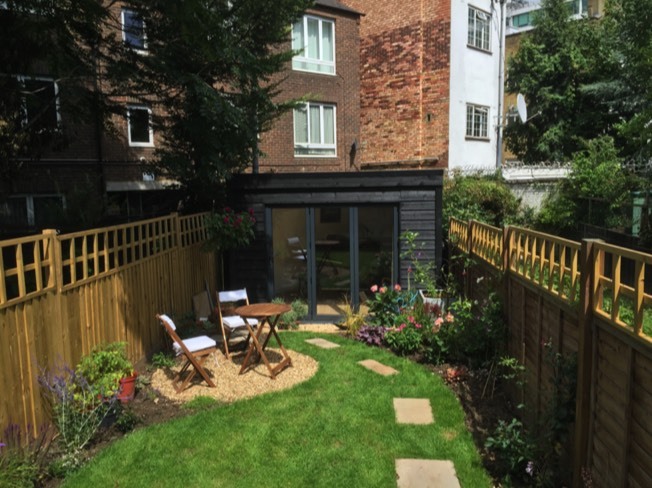 We can create a pitched roof garden room with tiled roof and oak cladding for your cottage or a contemporary office in cedar and steel for the urban plot. All have the same fantastic heat-retaining walls. Our buildings use a genuinely demountable system. Six screws are used to secure the interlocking wall blocks, making it possible to remove the cladding and pack the building for transport to its new site. Many of our clients have included bathrooms, sinks, store rooms and bedroom areas within their buildings. The sturdy walls are strong enough to add partitioning from new or in the future. As your needs change, so your Tomoku Hus can be adapted.